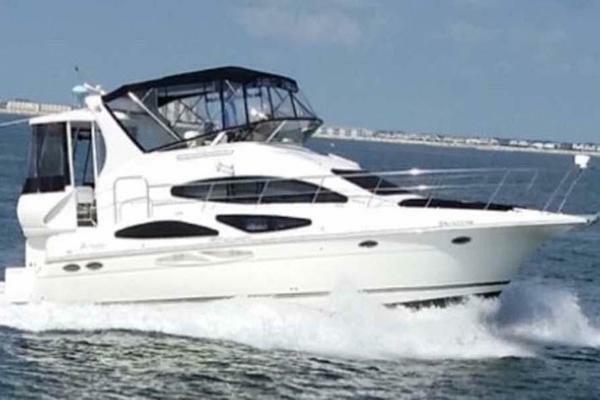 The Cruisers 4450 Express Motoryacht is a sleek, powerful yacht that offers all the advantages of express-style cruising. The cockpit provides comfortable seating associated with traditional express boats but eliminates the typical separation of guests between a bridge and aft deck. The cockpit includes a wetbar that can accommodate a refrigerator and ice maker, and a full windshield provides excellent wind and weather protection. Owners will also be able to select a Bimini top enclosure that attaches to a standard arch, or an aft hardtop with wing doors and a full weather enclosure. This boat offers triple-stateroom accommodations in a true aft-cabin interior. The master stateroom offers both privacy and luxury, is located aft, and features an island berth, walk-in closet, and a private head with shower. A guest stateroom is located forward, and a third stateroom is located amidships. The spacious, bright main salon offers additional sleeping accommodations with a large convertible dinette, full service galley, and an optional L-shaped sofa sleeper. Yanmar and Caterpillar engines also available.